March and April might be two months that are inherently connected with picking hops in the Southern Hemisphere's beer world but, for winemakers, it’s also the tailend of their own harvest. 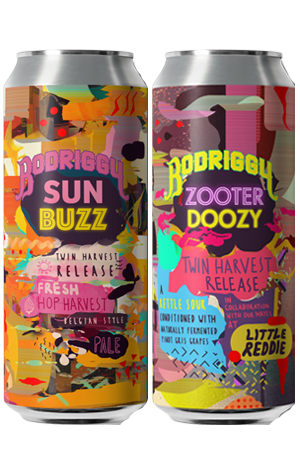 It’s a fact Bodriggy has decided to showcase through their Twin Harvest releases, featuring two colourful 500ml tinnies filled with liquids brewed with hops straight from the bine and grapes right off the vine. The first of those is Sun Buzz, featuring some 60kg of Hop Product Australia’s Enigma hops, shipped up from Tasmania and thrown in the beer just 12 hours after being picked. Considering it’s a Belgian pale, it’s not just those hops that are being showcased either, with clear fruity esters coming from the dark amber beer. The fresh hops deliver lemon and pear with some subtle stone fruit, making for a beer that’s rather reminiscent of a vibrant pinot gris. Speaking of which, it’s such grapes that are used in Zooter Doozy, made in collaboration with Castlemaine winery Little Reddie. They've turned out a kettle sour with a decent level of pucker and flavours of zesty lime juice, citrus and redcurrant.